Wow! Hot game on a cold Saturday Night! After totally almost winning the last two at home, the Nucks were facing another tough challenge. Syd and the defending Cup champs. Champs that haven’t had a championship start to their season, but still had to be considered dangerous with their only visit to Crosby’s old shooting range. The key thing, as outlined in the Westy Destiny Playbook, is to not take penalties against the league’s hottest road power play. You might think the Nucks are familiar with that prophetic tomb. Just not in the way one would hope. In the first 3 minutes what do the Canucks do? If you guessed take a penalty, you’d be so correct that you’d earn the Kreskin Spoon of Obviousness. That feels pretty good, right? Bulldog to put a little heat on the Nucks 84+% PK. It’s been a pretty good PK - top 10 even. But, the league’s #1 road power play is a very scary play. With unpredictable boogeymen making very scary unexpected passes and tragic (for the Canucks) finishes. The dreaded birds of ice water prey go to work. Guentzel takes a cross crease feed from Kessel and beats Marky. 1-Zip Pens 3 mins in. But, that’s not the really scary part. Less than 20 seconds later Burmistrov decides to high stick a Reaver. As a fan of the old western sci-fi genre, understand Alex’s sentiment. But, while he may look like a Reaver, Reaves is moonlighting as a player for the team with the league’s #1 road power play. With the scariest powerplay out of the game, it was time to watch the Killer Bees sting the unstingable Matty. No Vancouver player had scored on him in his long short NHL career. Until now. Showing patience and smooth hands in close, Brock rocks Murray’s record. Boom! 1-1 tie and the end of the 1st. A remarkable feat according to the shot count which tipped so heavily in Pittiesburgh’s favour that the count clock tipped over. The fast pace of the 1st got faster in the second. Both teams trading chances. Not equally tho. The Canucks were trading less shot coupons, but that was ok because Marky was stealing, smothering and munching up all the Pen shots. Phil the Thrill got the chill pill from Marky. Kessel was seen pouting on the bench after every shift. Back and forth, the Westy Destiny playbook pages were fluttering in anticipation of the story’s golden haired hero next shot. Could it be? Another flight of Killer B’s? Yes, yes, it could. The garage goes crazy. The apoplectic NM game thread goes Boeserik. Our young sniper is upstaging Crosby and Kessel on the scoreboard! 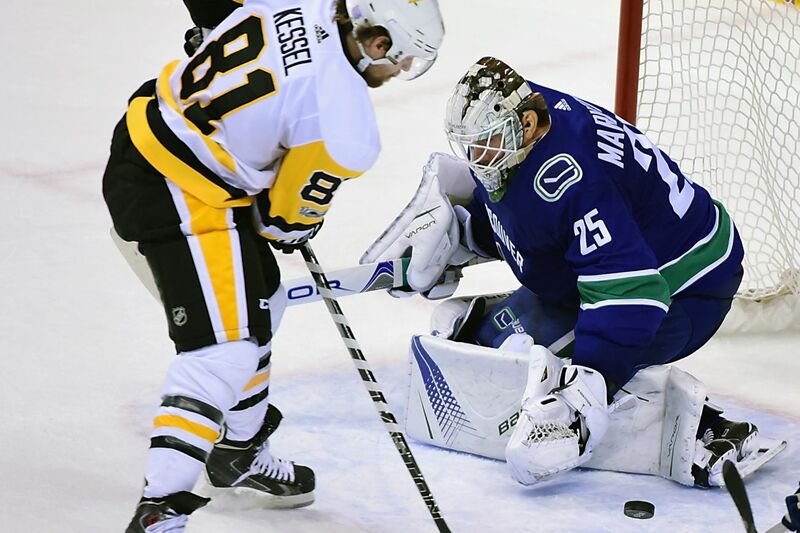 The Nucks played hard, but as described in detail, in the Westy Destiny Playbook, in print so minute that only scanning electron microscopes can make out one letter at a time, no pending pushback by the Pens could penetrate Marky’s one period shutout streak. Still getting out-shot-counted, the Canucks end the 2nd like the first, but better - leading 2-1 after 40. Even the HNIC panel were saying nice things about the Canucks - on national TV! As we’ve seen keeping a lead in the third is getting to be thing. 5-0-1 so far this season when leading after two. For the Canucks. No, I’m not making stats up. Just now. Can we expect a fowl Penguinish push in the third? Yeah. Dammit. Despite being instructed by a vet of NM game threads, to keep the ‘Pens penned in their end’, the Nucks get no shots, but the Pens get 4 or 5. And five minutes in, the Pens realise that beating Marky on this night will take some screening and tipping. Ice hats? No, this is better. Bo bulls up the ice, turns the Pens D sideways and dishes a pass to Brock who lasers his 3rd past Murray. The first Brocking Hattie! Woooooo! But, Jimmi, this fairy tale can’t really have a happy ending, can it? Yes, it can. Even better than a happy ending, it’s a happy ending with an exclamation mark - a Bo marker! Bo has 4 points on the night - a goal and 3 assists. Westy’s tirade talk about passing wasn’t passed over it seems. We have a bonafide 1st line on this night in history. And Marky made so many showstopping saves he looked like a bonafide #1 on a mission. He stopped 37 of 39 shots - could not be faulted on the two that got through. Congrats to Brock for making some Nucks hattie history too. Brock had a chance for 4 on the EN attempt, but (probably after hearing about Westy’s tirade talk), decided to let Tanev extend his Nucks D scoring lead. It almost worked. So...you might be wondering how the Green room was feeling about defeating the reigning Cup champs at home. Feeling pretty good it seems. The Nucks took on the Champs and won. That feels real good. Brock seems like can handle the media madness as coolly as he handles the puck. When I was 20, I might have been cool (in my own dreams), but didn’t have the maturity that Brock exhibits. Not sure if I have it now (I am sure, but let’s pretend). Great kid. And such a talented sniper. Phenomenal game! This team, this new, faster harder hitting Canucks are so much fun to watch. The Pens came in to wrangle in our ring and got pinned. And thus the neverland express stops briefly to pick up more newly-wild-eyed believers and make a run for Monday station. The Wings are in town. Feel they need a little clipping too. We beat them at their nest, let’s beat them in ours.